Mount Mansfield is so named for because of the image of a man the locals say can be found in its profile. Whether this is true or not, we never really found out, since during our visit, the bulk of the mountain was shrouded in clouds and fog. That didn't stop us from attempting to reach the summit, locally known as "The Chin" due to its location on the profile, on a summer day during our 2015 Roadtrip. Rather than hike all the way up the mountain, we decided to take the Stowe Gondola to the upper station, and then follow the Cliff Trail to the Long Trail to the summit. This route is a bit steeper than the alternate route of taking the auto toll road to the ridge, but it is markedly shorter. Since we were planning to bring the entire family (all the way down to the 7-month-old) we wanted to optimize for distance, rather than elevation. The Gondola ride seemed like a good balance. Because of the potential for weather, we wanted to get up the mountain as soon as possible, so we arrived at got to the lower gondola station around the time it opened at 10am. After paying $76 for a family pack of return tickets, we took the 5-minute ride up the mountain. It felt a little like cheating, but with a family of young children, I was happy to take an advantage we could get. As we rode up the hill, parts of the ridge were obscured by a shifting blanket of fog and clouds, yet patches of sun still poked through the changing landscape. From the upper gondola station, it was a short walk down the hill (on the left, looking back down the mountain) to the side trail which led up to the Cliff Trail. 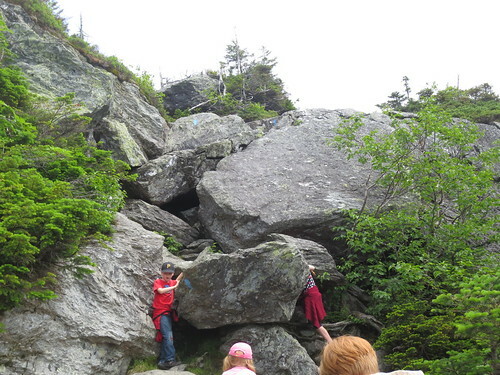 This was our first experience with New England hiking, and we quickly discovered two important facts that would be reiterated even stronger on Katahdin: New England trails are rocky and eschew the use of switchbacks. Going up the trail was slow going, particularly as our youngest children had to pick their way over rocks and roots embedded in the trail. As we made our way up and around behind the gondola station, we reached a point on the Cliff Trail that required climbing up and over some large rocks, with the aid of an iron rung embedded in one of them. This proved a bit much for the younger children, so Heather gave me leave to continue on the trail with the older two. Unfortunately, we’d gotten far enough that Heather couldn't retreat down the hill with the younger children, so they settled into a niche in the rock and awaited our return. It turned out that that part of the trail was the hardest. While we still had some steep rock to walk over before joining the Long Trail at the top of the ridge, it we didn't need to use our hands. After a few more minutes we’d joined the Long Trail, and were rewarded with some great views to the west. The fog was still thick in places, so we couldn't see all the way to Lake Champlain, but it was much clearer to the west than the east. The wind also picked up on the ridge, and we could see the fog pouring over the ridge from the east. The Long Trail wasn't nearly as steep or rocky as the Cliff Trail, and it didn't take long for us to cover the remaining distance to the Chin. The fog kept rolling over the ridge, and at times we were completely socked in as we walked through the alpine tundra of the Mount Mansfield summit area. 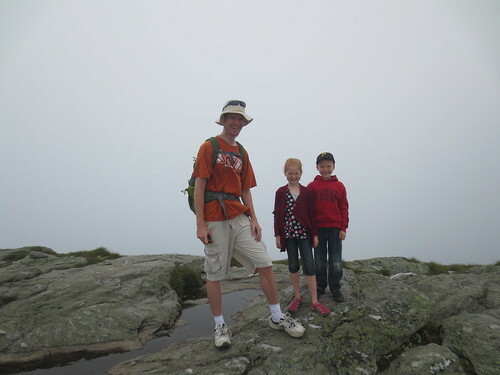 The kids enjoyed hopping from rock to rock, and I was glad to be up above treeline for the first time in a few years, even though I couldn't see much. The amount of traffic on the trail also picked up as we went along the Long Trail, with hikers from the toll road or the western approaches joining us. About an hour after we started, we finally made it to the summit, which was completely socked in. I was a little surprised to find a volunteer caretaker from the AMC hanging out on the damp, cool summit. We exchanged pleasantries, he took a picture, and the children and I enjoyed some of our snacks. The fog did lift occasionally, hinting at grand vistas, but we didn't get a chance to see very far in any direction. We only spent a few minutes on the summit before retreating down the mountain. As we did so, we started to hear thunder rumbling across the landscape. It was slightly disconcerting, given our prominence on the ridge, so we quickly made our way back to the Cliff Trail and down off the ridge. Within several minutes of leaving the ridge, we were back to Heather and the children at their hiding spot, and thunder kept rolling through the area. Luckily, we didn't have any rain, which would have made the rocky trail very slick and treacherous. After meeting back up with Heather, we successfully navigated our way down the trail and back to the gondola station, where we were slightly surprised to see the gondola wasn't running. The thunder and potential for severe weather had caused a shutdown of the station, so we ate our lunch and did some exploring while we waited for the gondola to start again. We weren't alone in this wait, and some of the people decided to start hiking down the service road to the lower station, rather than wait at the top. In the end, we were able to get back down by waiting for the gondola to run again. While the thunder kept rolling, the resort decided to start up the gondola for enough time to get the people down who were stranded at the top of the mountain, such as us. We were grateful we didn't have to hike the couple of miles down to the lower station, and decided that in celebration of our success, we should visit the Ben & Jerry’s Ice Cream Factory for a scoop and a tour.